It's common knowledge that working moms have a lot on their plate. They often find themselves apologizing left and right, even when society may be to blame. 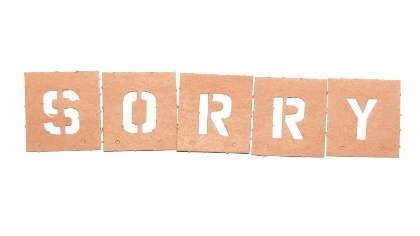 If you are a working mom and you counted all the times you said you’re sorry, either to your boss, coworkers, or to your family, there would be a lot. I’m sorry I’m late; I had to drop off my kids. I’m sorry I’m going to miss your baseball game, but I have to go out of town for work. I’m sorry I have to miss the sales pitch, but my son is sick. I’m sorry, but I have to reschedule to play date. I’m sorry I’m going to miss your recital, but I have to work. I’m sorry I can’t stay for the meeting; I need to pick up my kids. The word slips off your tongue without you even noticing. But why are working moms constantly saying sorry? Maybe it’s guilt. You may feel guilty that you can’t do it all. Family and work commitments collide and you are physically unable to do everything. But it’s impossible to do everything. So you apologize all the time and you feel like you are always letting someone down. Perhaps you feel like you are failing. Failing at work, failing at home and failing yourself. You just can’t give 100 percent everywhere, so you apologize. How can you do everything? When your physician tells you kids get nearly 10 colds and fevers a year, and you only have 5 sick days per year, and your contractor husband has none, you’ll be apologizing to work, or to your mother after you ask her to watch your sick little one because you can’t miss another day of work. But working moms should not apologize or feel guilty for wanting careers and a family. We can be full-time moms and full-time employees and make it work. But we have to stop feeling guilty for wanting it all. But not everything that overwhelms us is our choice. So instead of looking at the circumstances, we look at ourselves, and blame ourselves. In reality, is society to blame? When long hours are required from corporate workers, there is a lack of sick pay, hourly workers are expected to work a gruesome schedule, and there is a lack of paid maternity or paternity leave, working mothers are constantly running in circles trying to balance it all. Sometimes, working is out of necessity. It’s unrealistic to think that everyone can live off just one paycheck today. And we shouldn’t have to apologize for that. Perhaps it really is society’s problem and we should start talking about how sorry those decisions are that leave us with no chance of making it all work without apologizing.